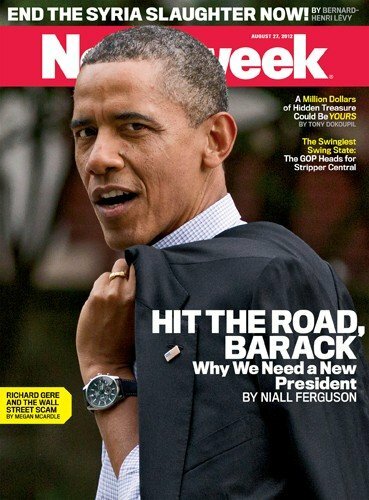 Hit the Road, Barack—Says Newsweek? Even some of the liberal elites have had enough of all the vacuous Barack BS and the know-nothing blather that comes out of his Chicago-style political machine. The fact that Tina Brown, Editor-in-Chief of Newsweek and the Daily Beast, has placed this photo with this caption on the cover of her Lefty publication pretty much sums up the extent of the liberal frustration at this inept and unqualified fraud. This entry was posted in Media/Arts/Entertainment, Political/Social and tagged Daily Beast, Hit the Road Barack, Newsweek, Tina Brown. Bookmark the permalink. 9 Responses to Hit the Road, Barack—Says Newsweek? And don’t come back no mo no mo no mo. When the birthers are proved correct, he won’t be gettin’ dat presidential libarry and the secret service detail will be halted and maybe he’ll be shipped on back to HIS mutha countray. A.Men – I’ve not heard Buh-rock before! I love it! For some reason Ms. Brown decided to go with a cover that featured an article not written by a Leftwinger. Either she’s sending Mr. O a message or she’s reading the tea (party) leaves and has figured out which way the wind is now blowing. Or maybe a way to stay afloat for short time longer? Ah yes, the financial motive–anything to get the readership up. Buh-rock probably didn’t return a phone call to Tina Brown! He went to Entertainment Tonight! President Kardashian will live in Hollywood after losing in Nov. 2012 —- until THEY throw him out. You aren’t kidding. Obama will continue to campaign in Hollywood for living expenses because he has no job experience. Hollywood will go along for a while until they see what a leech his is. We will be supporting his Secret Service team forever. You got that! When he loses in November, he’ll get some shoulders to cry on and some Hollywood attention. But it won’t take long for him to be oh so old news.